Bored With Bran? Bah! | What Smells So Good? I present you today with an unlikely, and somewhat boring, super hero in the world of ingredients. This "super-nutrient" is a key factor in staying full, regulating blood sugar, and alleviating or preventing a host of problems like hernias, hemorrhoids, diverticulitis, heart and bowel disease and high cholesterol. It's also more common than you think, incredibly easy to take in when you eat a healthy, balanced diet full of actual foods. So, what is this miracle food? Fibre. I know. Fibre is the stuff of the horror stories we were told as kids... the ones about what we'd be doing as little old ladies and men, slurping back stewed prunes and regaling each other with tales of each and every quirk of our large intestines and bemoaned how our hemorrhoids were acting up due to the clouds rolling in. Or we'd be sitting in the old age home squabbling over the last bowl of overcooked oat bran, waiting for the nurses to bring us our daily dose of Milk of Magnesia, right? Well, I for one would rather avoid that drama. Like I said, eating a healthy diet rich in fruits, vegetables, whole grains and legumes will get you well on your fibreriffic way (so to speak). The problem with most of us is that the modern dietary staples that are easily bought and consumed are not exactly conducive to achieving the daily recommended goal of 35 grams of fibre. Even the kids' breakfast cereals that now boldly display the tagline "made with whole grains" don't go very far down that path - a serving of one of those will only net you 1-2 grams at the most. I thought this whole lack of fibre thing was worldwide - I mean the "big brands" out there are pretty much universal. But as I was looking through some of the info I found on the subject written by dietitian Suzanne Havala I found evidence that some people in China eat over 70 grams every day! Even taking an average of Asian diets, average intake is 33 grams - a far cry from what most of us in Western culture get at 13 grams. But getting in good doses of fibre takes a bit of work, and can be a bit of a bore. How many bowls of All-Bran can you chew through before that bacon and egg platter starts calling your name? Sure, there's the standby brown rice and steel-cut oats, but they take time and can have their basic goodness drowned out in the quest for flavour. And those expensive bran muffins at the coffee shops seem like a great way to get in a good dose of the stuff...until you find out that each one is packed with about 350 calories and 10 grams of fat - not to mention 33% of the RDA for sodium (790 mg) and 41% of the RDA for sugar (37 g)! And that's before the latte, which you know you can't resist while you're sitting at the drive-through! It seems to be a fairly lose-lose situation. Well, making your own muffins, laden with fibre, isn't out of the question. In fact, really, making your own is one of the best ways to start enjoying your daily "do your body good" routine. Not only can you control the fat, salt, sugar and calories of the goodies you make, but they're infinitely variable! Apples one week, bananas the next, throw in some just-ripe peaches and strawberries mid summer or even indulge a little and add cocoa powder and chocolate chips for a treat. An added bonus is that they'll cost you less than all those trips to the coffee shop - no extra gas, hiked prices, tip jars or extra lattes to contend with. Homemade is too much time spent, I hear some of you say. Well, when you take into account the side trips for the snacks at the cafes and the trips to the cafeteria at work or school, the wait time is pretty much even, if not less with home made. 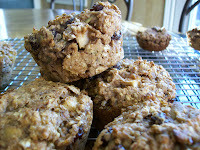 Not to mention, when you bake at home you'll be making a bunch of muffins, not just one or two! So are you ready to try for your 35 grams a day? Preheat oven to 350 F, and grease 24 regular or 12 jumbo muffin cups (or 12 muffin cups and 1 loaf pan). Mix soy milk, soy yogurt, banana and lemon juice. Add applesauce, canola oil, maple syrup and sugars. Mix dry ingredients in a separate bowl, and add to the wet mixture. 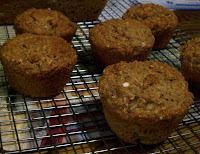 Bake standard muffins for 20 minutes, jumbos 35 minutes and a loaf 45 minutes (will test clean). 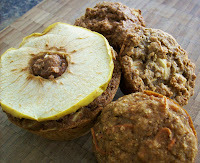 To make the apple-ring "tiara" on these muffins, I peeled and cored them before slicing them with a mandoline. My Oxo's not as nice as this one from ChefsCatalog, but it's servicable and still does a great job - be sure to check out what the other foodies are doing with mandolines tomorrow when it's FoodBuzz' Daily Special. Preheat oven to 375F,grease or line 12 muffin cups. In a bowl, beat together applesauce, flaxseed, soy milk, agave nectar and maple extract until smooth. Add flours, bran, oats, baking powder, baking soda, cinnamon and nutmeg. Mix just until blended - do not beat. 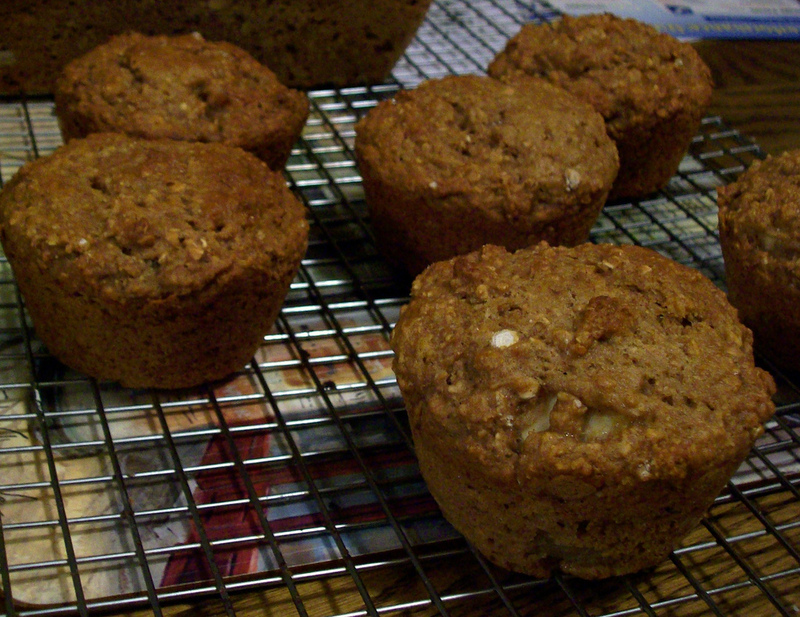 Portion into muffin cups and top each with an apple ring, if desired. Bake for 20 minutes. Cool 10 minutes in the tin before unmoulding. Soak raisins and pepitas in the whiskey overnight. Drain and set aside. Peheat oven to 375F, grease 18 muffin cups or line with paper liners. Whisk together flaxseed and hot water in a small bowl, set aside. In a medium bowl, stir together flours, wheat germ, wheat bran, baking powder, salt and spices. Set aside. In a large bowl, beat together applesauce, sugar, maple syrup, oil, tofu and vanilla. Add flaxseed mixture, blending well. 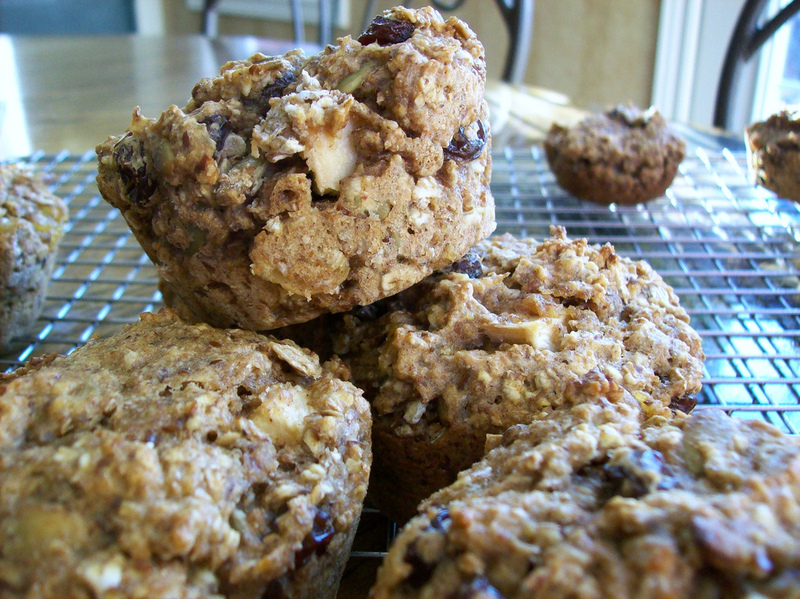 Stir in oats, rye flakes, raisins, apple and pumpkin seeds gently. Bake 20 - 25 minutes, until a skewer comes out clean. Remove from tin. Preheat oven to 400F, grease or line 14 muffin cups. In a medium bowl, whisk together flours, bran, baking powder, salt, allspice and cinnamon. Set aside. In a large bowl, beat together brown sugar, apple butter, egg and milk. Stir in the flour mixture until just blended, then add the flaxseed and kasha and fold in. Bake for 25 minutes. Cool in the tin 5 minutes before unmoulding onto a rack and cooling completely. What's usually on your breakfast table? Do you have a favourite recipe for a healthy baked good?